More sales, the primary thing every business owner needs — increased sales figures. Yet, the majority of companies constantly struggle to even match their year to year sales numbers, much less achieving any gains. Right this minute, real buyers are looking to purchase products and services just like yours. Your business provides exactly what these potential customers are looking for, but do you have everything in place to convert these prospects into customers? Is your sales pitch putting the chill on these hot buyers? Power of Presence Marketing’s Sales and Marketing Consulting Service will help you increase your sales by asking the right questions, and working with you to improve your sales funnel. You need to put your irresistible offer in front of these buyers so they will choose to buy from your business. Simple, right? Not so, if it were you would not be spending the time to read this right now. Let’s cut to the chase, your business needs more and inventive ways to entice buyers, to increase your gross sales. If this resonates with you, please continue reading because Power of Presence Marketing’s Consulting Services will help you get to where you want to be. How do you quantify the effectiveness of marketing? What you, and every other business owner wants is not marketing, you want sales. Now that is something you can quantify all day long. At Power of Presence Marketing we focus on helping our clients make sales. We don’t just offer some back-room SEO hacks performing mystical tasks. You need a plan, a road map to sales. We focus on the metrics, and all the techie stuff, while you operate your business. You need sales, and that is what we deliver – more opportunities for you to make more sales. Typically, during our initial discussion, we help our clients discover a mound of available sales which can be realized right away. It is not uncommon for immediate cash flow to be turned on after we begin working. It is like opening a spigot, and letting the water flow out. It was there all the time, but the handle just had to be turned on. Your business should anticipate an initial influx of revenue soon after we begin working together. But the job has only begun. Right away we begin to analyze your business to determine opportunities already existing that you are able to maximize. We then take a look at: your sales funnels, how you handle the back-end of sales; new ideas for marketing your product or service; establishing your company as an authority in your market; integrating technology into your marketing; cultivating your community; all this and more. With our holistic approach to marketing your product or service you will not have to worry about “Penguins,” “Panda’s,” or whatever other animals Google may find to throw at us. Taking care to give proper attention to all the geeky stuff, when our methods are implemented Google, and the other search engines, will love your websites. But that is only part of what Power of Presence Marketing does, in fact, in the overall scheme of things, it is the lesser of our tasks. Much of what we do will apply to the offline aspects of a business as much as the online; we marry the two to make your company a powerhouse of sales. 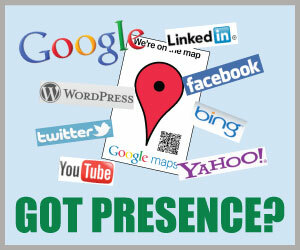 Yes, Power of Presence Marketing does all the Internet marketing things your business needs. We also take into consideration the whole of your operation, from customer acquisition, to sale, through followup. If you follow our plan your sales revenues will increase. Who would not want that? The Power of Presence Marketing Consulting Service provides actionable intelligence to help your company compete, and excel, in the digital space, and offline. The Power of Presence Marketing Team Members dedicate time and resources to analyze your present position, they then bring forth workable solutions tailored specifically for your business, and your target market. Your marketing plan will enable growth of your customer base, client satisfaction, and sales conversions. Our fees are quickly regained, many times over, by the increase in sales you will experience. What your business requires from our storehouse of services will vary from the guy next door, we will tailor a plan specifically for you, allowing you to select what you feel is most valuable to you. More of the same is not what is going to increase your sales, call today to talk to one of the Power of Presence Marketing Consulting Team Members to discover how we can tailor a program to help grow your business. Call now 877-727-3864, or use our contact form to arrange for someone to contact you.